This post was published last year at this time and since my students are preparing essays on the subject I thought I might offer it once again. 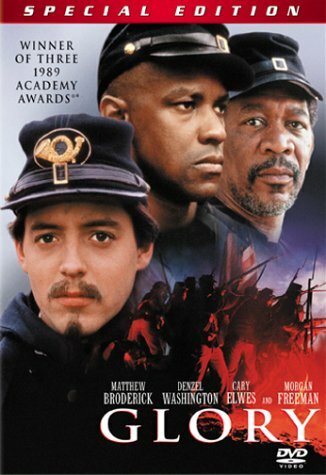 Today my Civil War classes finished watching the movie Glory, which is still my all-time favorite Civil War movie. Students enjoy the movie in part because of the heroic story of the unit and the performances by Denzell Washington, Morgan Freeman, and Matthew Broderick. The movie does a very good job of addressing the discrimination faced by the 54th Massachusetts as well as their heroic performance at Battery Wagner in July 1863. Like all historical movies Glory gets certain things right and certain things wrong. One of the themes that the movie captures is the slow progress that Col. Robert G. Shaw experienced in learning to more closely empathize with his men as well as the gradual changes that took place among white Union soldiers as they questioned their own racial outlook in response to the battlefield prowess of black regiments like the 54th. This is an issue that my students recently read about in an article by Chandra Manning. As for problems, well, they abound throughout the movie such as the profile of the regiment, which is presented primarily as a unit of fugitive slaves. Most of the men were free blacks from Massachusetts. Other problems include the time frame for the raising and training of the regiment which began in 1863 rather than 1862 as well as the failure to acknowledge Shaw’s marriage at any point in the movie. Beyond pointing out such oversights throughout the movie I want my students to be able to think critically about the choices that go into historically-inspired movies such as Glory. Such questions can include character development and the broader message that movie producers and writers hope to convey to their audience. In reference to Glory what stands out to me is the emphasis on a progressive story where the individual characters as well as the unit itself becomes more closely connected or identified with the national goal of emancipation and nationalism. Col. Shaw (played by Broderick) volunteers his regiment in the attack on Battery Wagner as a means of impressing upon the nation the sacrifices and bravery displayed by his men. Tripp (played by Washington) begins the movie with an overtly selfish perspective, gradually comes to see the regiment as family, and finally falls in battle while holding the stars and stripes. Even Thomas, who represents the free black men of the regiment and comes to learn during training that he has more in common with fugitive slaves, finds redemption and self-respect by volunteering to carry the flag before the assault on Wagner. The decision to end the movie with the failed assault at Wagner solidifies this progressive theme, which links the men to one another and, supposedly, the goal of the United States by the middle of the war. The final scenes depict the grim reality of the battlefield, including shoe-less dead black soldiers, and a mass grave in which both Shaw and his men are buried. As the movie ends the viewer is told that the performance of the 54th Massachusetts led to the recruitment of upwards of 180,000 men and that President Lincoln credited these men with turning the tide of war. The upshot is that the viewer finishes the movie with the impression that the story of the 54th has been brought to its completion, in large part, because of the death of Shaw. It’s as if the mission of the unit, in terms of its contribution to the Civil War and American History, has been fully realized. It is through defeat and death in the regiment that the nation experiences a new birth of freedom. The problem is that this completely ignores the history of the regiment through to the end of the war and the challenges that it continued to face. In fact, a broader look at the history of the 54th suggests that it was not at the hands of angry Confederate soldiers that constituted the gravest threat to black Union soldiers, but their own government. It is with this in mind that my students are now reading a wonderful article by Donald Yacovone, titled “The Fifty-Fourth Massachusetts Regiment, The Pay Crisis, and the “Lincoln Despotism”” which is included in the edited collection, Hope and Glory: Essays on the Legacy of the 54th Massachusetts Regiment (University of Massachusetts Press, 2000). The “pay crisis” is depicted in that wonderful scene where both Shaw and his men tear up their vouchers after learning that they are to be paid under the terms set out in the Militia Act of 1862 – $10 for black soldiers as opposed to $13 for white soldiers. Unfortunately, the scene is used to highlight the evolution of Shaw’s identification with his men and is promptly dropped as an issue. Well, it was an issue throughout much of the unit’s history and it grew worse following the failed assault at Wagner in July 1863 and Shaw’s death. The article does an excellent job of detailing the steps that both the men of the 54th and its new colonel took to convince the Lincoln administration to rectify the situation. The situation continued to deteriorate following the Federal defeat at Olustee, Florida as tension in the ranks grew culminating in cases of mutinous discontent. The most notorious case occurred on February 29, 1864 when Sergeant William Walker faced a firing squad for protesting unequal pay after ordering his company to stack arms in front of their colonel’s tent in November 1863. Shortly thereafter, Private Wallace Baker was arrested and executed for striking an officer after refusing to obey an order to fall in for company inspection, also in protest over pay. It was not until July 1864 that Congress revoked its stance on the issue and awarded the men equal pay from the first day of their service. I am hoping that this broader focus will give us much to discuss in class tomorrow. I want to touch on questions of how Hollywood shapes our perceptions of important historical events as well as how this broader focus helps us to anticipate the challenges of Reconstruction and the federal government’s eventual abandonment of these men and the cause of black civil rights. This reminds me of my favorite scene in the movie which precedes the assault at Wagner. Shaw approaches Tripp and asks him to carry the regimental colors in the next engagement. Tripp refuses and a brief conversation ensues regarding the possible consequences of the war. At one point Tripp asks, “What are we going to get”? The movie leaves the viewer with a sense of optimism for the future; on the other hand, Yacovone’s piece better prepares students with the tragic quality of Tripp’s question. The honest answer is that I have no idea as to the accuracy of the battle scenes. They seem more realistic than anything you will find in Gods and Generals or Gettysburg or most of the other recent movies. My favorite scene in the movie is at the opening when Shaw's unit marches passed a group of fugitive slaves. Just to follow up on my last comment re: the accuracy of Civil War movie battle scenes. I tend to use the “Would I want to be there” test. In the case of the battle scenes in Glory the answer is a definite no. However, I think I would like to fight in a battle scene along the lines of Gods and Generals. It doesn't seem so bad at all. In fact, it looks like fun. Even the Union soldier who loses his arm and asks permission from his commanding officer to leave the fight doesn't look so bad to me. I don't think any filmmaker would want to film a CW battle scene that's 100% accurate. This was before smokeless powder so, after the battle had been going for a while, you couldn't see much even if the artillery and the soldiers' weapons were the only source of smoke. Quite often it wasn't. At the Wilderness, major fires were started. At Gettysburg, Union troops intentionally burned down the Bliss Barn to prevent it from continuing to be used as a ANV snipers nest. As for hearing anything, not only was there the “continuing roar of musketry” but all that artillery banging away. No wonder so many CW veterams were stone deaf in their later years. Saying that, I've read actual veterans saying that the Battery Wagner attack scene in “Glory” and the opening combat scene in “Saving Private Ryan” are the two screen depictions that come the closest to capturing the combat experience in a movie. I would agree since a movie that is 100% accurate would have to include at least a few dead bodies. 🙂 I still remember that feeling after seeing “Saving Private Ryan” in the theater. It took me a good day to shake off a lingering feeling of depression as a result of that opening sequence. It was compounded by the fact that I am good friends with a gentleman who was part of that first wave on Omaha Beach. Spielberg clearly pulled something off in that movie. By the way, since you've set up a DISQUS account why not upload a pic of some sort? I’m suspicious. Thanks for answering my questions re: Glory. My favorite CW movie as well. Birth of a Nation has a “realistic” battle scene. I actually show the entire movie if I have time in class…it really brings home the human side of the war. they are very good with historic films on an independent level…they are very good with historical accuracy like the uniforms, rifles and tactics in more than just the Civil War era. I assume the actual battles didn't have stirring music in the background. British director Peter Watkins did a film on the Battle of Culloden in the 1960s. Shot in 16mm newsreel film, the camera shaking from the impact of shelling, it seemed to be an utterly convincing vision of 18th century battle, with the grimy, pockmarked combatants struggle amid nasty chaos. No movie stars, no heroics. Yet all Wadkins was really doing is using the conventions from the TV images of Vietnam and other conflicts that his audience(including me) were familiar with. All filmed recreations of battle are necessarily artifical. And that's OK. Homer's descriptions of the Trojan War were probably off a little. Can we argue that the 54th has become a symbol of black soldiers in the Civil War? Since most of those troops were fugitive/liberated slaves, the film becomes more true to the experience of most of the men in US Colored Troops units. I agree. At the same time it's hard not to think that the choice to emphasize the experience of fugitive slaves rather than free blacks was made to highlight the central themes of the movie. I don't have much of a problem with this since it does speak to the broader profile of black units. Coming to the blog rather late, so I’m not sure if anyone will read this. Some here have commented on the problems facing a film director when trying to recreate a Civil War battle. The real questions revolve around “which battle” and “which year”. The combat during the war changed dramatically from 1861 to 1865. One could also ask about “where on the field.” Shooting the cornfield battle at Antietam would be quite different from the assault on Missionary Ridge at Chattanooga. The issues of heavy smoke and fire as well as hideous wounds do come into play in the fiercest engagements, but I really like the first skirmish portrayed by the movie Glory. Most CW engagements resulted in relatively few on-field casualties until the Overland Campaign in 1864. The assault on Marye’s Heights, Shiloh, Pickett’s Charge (with Pettigrew), Little Roundtop, Franklin, and Chickamauga stand out because they were particularly bloody. Look over the total casualty figures for about 50 different regiments and you will wonder how so few were lost in battle when you look at the casualty totals for the war. These units will likely show you 2-1 losses where disease and accident took more lives than battle wounds. So, which was the best movie battle scene. I have a couple of candidates. The assault on Battery Wagner (which was unnecessary by the way), the assault on Marye’s Heights (Gods and Generals), First skirmish of the 54th in Glory. What mars all of these, however, is the girth of many of the infantry reenactors and (in the 2 Ted Turner films) the tentative nature of the fighting that resulted from safety concerns for the reenactors. More paid extras and stunt men would have gone a long way to improve the battles in those films. A decent script would have helped too. I love this movie it is awsome! I believe based on the movie and what i know about the history of this topic, i believe they were very true to each other. Because this is a movie, it of course, has to have some elements of fiction and sympathy to make it enjoyable to watch. The actor cast as Colonel Shaw, Matthew Broderick, was a very good match to play this character. He looks a lot like him and he cane across as caring, yet scared, which made the movie more true. I agree that the movie went far as to show the discrimination between the black soldiers and the white commanders, and how much of an isssue this reallly was for everyone. Audiences got a good feel for battle and how it is while there, and also got to see how difficult it was to train black soldiers. But we also got to see how much they cared about fighting and how much they wanted to be there for their country. You do realize that you were watching a movie based on history, instead of a documentary . . . right? Of course “GLORY” isn’t historically accurate. I cannot even think of a historical drama – whether on film, television, on the stage, in a novel or in a painting – that is purely 100% accurate. Just to let you know, it is considered a rule by fictional writers or other artists that if history gets in the way of one’s drama or work of art, toss it out of the window. Artists and writers have been following this rule for a long time . . . including William Shakespeare. Again, I am not sure what the issue is here. I am not criticizing the movie for not being 100% historically accurate. That said, many people watch movies as if they are. I am simply using the movie to highlight the difference between Hollywood and history and to point out examples from the movie that illustrate this point. Hollywood has a great deal of influence over how the general public remembers the past. Just think of Gone With the Wind. That’s a rather general assumption to make. Why do people act as if the only blacks that existed in the North before the Civil War were fugitive or liberated slaves? Free people existed in the North as far back as the colonial era. Thanks for taking the time to comment, though I am not sure I understand your concern. That’s a rather general assumption to make. Most of the units were made up of former slaves. There is nothing controversial about that statement. Of course, free blacks lived in the North going back into the colonial era. A small number even lived in the South as well. In fact most of the 54th were free blacks not fugitive slaves. What happened to the characters? Were any of them accuracte depictions other than Gould? D.Washington,Morgan Freeman, the character of “Thomas”, where any supposed to be William Carney – first African American to receive the Cong. Medal of Honor? I can’t remember who took up the flag at the end, was it supposed to be Carney? From what I’ve read/seen, most of the troops were at least semi-fictitious, although, as in the case of Morgan Freeman’s character, there was at least some basis in reality. What parts of the movie is inaccurate? Not too concerned about “attacking Battery Wagner the wrong direction”as many pundits mention. But VERY Hollywood concerning the 54th’s first battle(Grimball’s)on James Island-a place very familiar to me. The 54th. was covering the evacuation of all James Island by Federal forces who had previously met disaster earlier intheir mass attack repulse at Battery Lamar(Secessionville). There was no great hand to hand trouncing of the small Confederate force opposing them (infantry,cavalry) as depicted in that fanciful battle scene. And-the 54th. attack was pretty well ended at Battery Wagner when Shaw was killed.Some accounts mention Federal units firing into fleeing 54th. ranks fleeing because they were disrupting the mass Union columns following the 54th.’s initial lead into the assault (refer Milton’s Siege of Charleston)Actually it was a (white)Connecticut unit that actually got inside Wagner and fought hand to hand before being entirely wiped out or captured…. I just personally grow tired of depictions of Southern troops as this ragtag group of crazed barbarian killers. Glory was rife with those depictions. At Antietam they made a point of showing the neatly filed lines of the Federals then cutting to the sloppy rebel horde pouring into the scene. Historically speaking, in account after account, in battle after battle, Southern troops were the exceedingly coordinated and well led, not the opposite. Just because they were more poorly equipped and sometimes shoeless didn’t make them a mob. A mob could never have secured repeated victories the way they did. As repugnant as the institution of slavery was, it was not, in fact, the object to which the common Southern soldier fought. Too often ignored in these sorts of films (aside from the poorly done Turner films) is the fact that they were fighting to protect their homes from invasion and occupation. At no time was the Fedral government under ANY such threat, despite Lincoln’s constantly inferring it was. In spite of this, I do like the film, though for me, a “great” Civil War film has yet to be made. One that depicts the tragic and unnecessary horror it was for both sides. You said: I just personally grow tired of depictions of Southern troops as this ragtag group of crazed barbarian killers. Confederate soldiers characterized the killing of black Union soldiers at places like the Crater as a different sort of killing. You should read the first chapter of my book on the Crater for example after example. Yes sir, but the Irish of New York who lynched blacks in the streets, blaming them for the fact they were being forced into the army at gunpoint, had similar sentiments. What I spoke to was the motivation for men to take up arms in the first place. What’s always asked and discussed in classrooms across America is why did the South secede? It’s, of course, an important question. What seldom is examined but perhaps far more important, is why did the North refuse to let them go? I would argue that while secession was largely driven by the slave issue, the war itself was not. And it certainly had nothing to do with the latter question. The anger you highlight toward black soldiers by nearly-conquered Southern soldiers was scapegoating and racism in unison. To somehow paint this as the Southern cause made manifest is rather disingenuous don’t you think? Certainly, white Southerners did not hold a monopoly on racial violence.All of the questions you raise are important and have been explored by countless historians. I can’t speak to what is or isn’t taught in the classroom. This is a rather simplistic distinction. I am not entirely sure what this means. I can tell you quite a bit about how white Southerners understood their battlefield experiences facing blacks because they wrote extensively about it. I apologize. I’ve taken the discussion well off course from a discussion of this fine film and I do indeed concede your points about the racial hatred that colored the Confederate soldier’s behavior in battle when confronted with black soldiers. I confess I’m not as well read on the topic and will check out your book. I will say however that I have a 4th great grandfather who fought with a Minnesota regiment in Sherman’s Atlanta campaign, and another who fought in a Georgia regiment defending his home. I’m even fortunate to have in my home the rifle the former used. We have some letters he wrote home and he indeed fought for what he believed was true patriotism. I’ve read a diary account of a drummer boy in his company who described in great deal the destruction they wrought from Atlanta to Savannah and more ferociously in South Carolina. The accounts both fascinate me and sadden me. That patriotism could be defined as invading and destroying other men’s homes and lives is so odd to me now that I’m an adult. The latter grandfather survived the war but lost 2 brothers and a mother so grief stricken that her son’s body was never recovered, she went into a depression that may have been what killed her before the war was over. Other more extended family was scattered as refugees when their homes were overrun in near Macon. The notion that families who didn’t own slaves would suffer so greatly to preserve the institution is just lunacy to me. The war was a sickening and needless tragedy. Thank you for the discussion sir. Such a pity that 150 years later, African Americans are still having to contend with discrimination….along with Hispanics, LGBTQ, and anyone else who does not fit the bogus notion of a “genuine American”. Maybe after another 150 years……? The main problem as I see it-most of today’s (revisionist)historians are guilty of using today’s PC attitude as to what was done formerly. The Founding Fathers never envisioned blacks as voters.This attitude was firmly held by Northerners and Southerners. When the Founders fought in 1776 over “Property Rights”-that (inconveniently)meant ownership of slaves too. PC is a way of life in Hollywood depictions of events. The nonsensical Hollywood version of the 54th. Mass. attack at Grimball’s Causewaydefeating the Confederates (see earlier post) is a case in point.It did NOT happen…. Even Ivy League historian James McPherson,who has created a career pontificating The War was just about slavery-admitted(surprisingly)that in his study of Why They Fought(the Confederate soldiers rank & file)almost never mentioned “slavery”in hundreds of wartime letters-but routinely mention “Independence”as to why they fought so long and hard. I just finished teaching this book in an undergraduate class. That is NOT what McPherson argues. I suggest you go back and-re-read it before making such irresponsible statements. I will back Kevin up on this point. You can go right to page 20 of For Cause & Comrades to see what McPherson said. For most Confederate soldiers, the issues of slavery and liberty were entwined and that is what McPherson says. They went hand in hand for each other. You are free to believe whatever you want from McPherson’s words. McPherson’s surprising admission (in his tome) that the Confederate soldiers overwhelmingly mentioned fighting for Independence and then somehow concluding they were fighting exclusively for slavery is not terribly logical. Towards the war’s end the Confederate Government even offered freeing the slaves but NOT dropping the essential Southern desire for Independence. The Feds rejected this stipulation and so the war of complete conquest continued. Are comments “irresponsible” when you don’t agree with them? Care to go back on Topic about Hollywood’s 54th. fanciful portrayal? Like I said you mischaracterized what McPherson said. Go back and read it again. Sir, I likewise have to say that you too mischaracterize McPherson’s conclusions in his book by inferring it was somehow the opposite of what the gentleman stated. Reading the very articles of secession of the various southern states is most telling when it comes to why the States seceded. It does not, however, explain the question of what motivated men to lay down their lives on the battlefield. You have accused me of oversimplifying to make such a distinction but I believe it is you sir who have oversimplified your case. The war was not a war for slave preservation any more than it was for slave liberation. The first shots rang from southern guns but the Lincoln administration made the decision to fortify the garrison at Sumter with full cognizance of the consequences that would follow. Richard N Currant’s comprehensive work on the subject lays it out in wonderful detail. Sadly, McPherson, like so many historians, takes the lazy position that it simply follows that sessession led to the war. The sincere efforts of the peace commissioners and the efforts between Major Anderson and the mayor of Charleston and governor of South Carolina speak against that narrative. The war came at the US administration’s choosing because they held it illegitimate and employed violent force as its remedy. A peaceful and democratic secession was put down by force and the effort was seen for what it was by the governments of Europe. All of this said, the research McPherson performed was very valuable stuff. Sadly, McPherson, like so many historians, takes the lazy position that it simply follows that sessession led to the war. Actually, in Battle Cry McPherson states the opposite. Sigh. Admittedly haven’t read it. My comment was regarding his statements in his Book TV hour long discussion of For Cause and Comrades where he responded such to a question. I know men of your position grow tired of defending it against folks who reasonably challenge it, and I know this entire thread was not designed to discuss the broad subject of the period politics, but you are quite dismissive of valid points it would seem. It is however your domain and can do with it what you please. Please tell me what points I am “dismissive” about. The previous writer stated something that McPherson doesn’t claim in his book. I pointed that out having just re-read it for for a seminar class that I am teaching. Now, please feel free to provide the quote from the BookTV episode. It’s somewhere in the middle toward the end of his talk and before the question and answer. He goes on to answer a couple questions stating the theme in other contexts. My apologies for not giving you time markers. I’ll attempt to do so soon but I just got off a 12 hour shift in the ER. As far as being dismissive, I think McPherson does indeed comment on the fact that slavery wasn’t particularly mentioned much while independence, Liberty, duty, and honor are. It’s not to say slavery wasn’t intertwined in the definition thereof but as he said, it was “taken for granted” that slavery was simply a part of that greater understanding of what their rights and Liberty was. “I’m fighting because you’re down here” was Shelby Foote’s oft-cited southern maxim and but you seem to reject it outright. Am I mistaken? Please understand sir, I don’t reply in the spirit of contentiousness. I do only for the sake of civil discussion. The study of this period has been a passion of mine since boyhood and my understanding and perspective of it has evolved over time. I appreciate you taking the time, but you still have not pointed out where you disagree with my response to the other reader. Please re-read his comment and my response. I am not being contentious, I am simply looking for some evidence of where I am mistaken regarding McPherson. The ball is in your court. I was wondering why is there no mention of survivors of the 54th after the assault on Fort Wagner? Completely ignoring the presence of Sergeant William H Carney, his contribution at Ft Wagner and his survival and subsequential being awarded the Congressional Medal of Honor. This post was not intended as an exhaustive history of the 54th Massachusetts. What I would like to know, is in the movie Colonel Shaw voluteers his regiment to lead the assault on Fort Wagner. Is this historically accurate? Or was his group assigned this task because it was mostly considered a suicide mission? Shaw did indeed volunteer his regiment for the assault. If you would like to learn more I recommend reading Russell Duncan’s book, Where Death and Glory Meet: Colonel Robert Gould Shaw and the 54th Massachusetts Infantry. The rest of the pay could not be shown likely, as the rest of the war. But you are exploiting this fiction to try and offer a substitute to amplify only one perspective you believe in the importance. The first paragraphs you offer on the subject of what the film captured and intended to point out was the main meat of the subject concerning this regiment in many ways, and your focus is on the continuing development of the regiment’s history. Howeve,r, this does not disqualify the meatier points of what glory shows and you yourself have explained clearly. There is no historical inaccuracy in that intent. Only details may be of corrupt continuity, and even so, most underestimate the failings of historians equal and rival Hollywood. You say they are progressive in mood with this film. Yet it still ends truthfully speaking of historical events for the Most part, and it is not wrong by showing how it relates to the continuing history of toppling slavery and maybe one day, though not today given our 44th President, racism itself. It does not have an anachronistic air to how they show the regiment, and therefore your progressivism is rather subdued by the times, or in blunt truth, a lie…. The movie Glory was about 30% accurate. Like the nonsense movie Redtails, it had an agenda to promote a false participation of ex slaves in the Civil War. To be sure, Africans fought bravely, but no more so than their white counterparts and many times less. To promote them as being more than they were denigrates their contribution. They were simply soldiers, no more no less. As for the “realism” of the battle scenes, quite frankly they were ridiculously naive and did not come close to the real power of a Civil War battlefield. It was a big yawn. Both the movie and the political intent, which ignored true history. Black men, white men, all were equal on the battlefield, and no, black soldiers were not targeted by white confederates anymore than were their white northern fellow soldiers. And, as someone here has commented, very few of the black union soldiers were ex slaves. And while we are at it, the idea that the Civil War was fought over slavery is ludicrous. It was about taxes and money, as wars are usually fought over. Sorry folks, but history is history and usually not what is taught in the Ivey League. It was about taxes and money, as wars are usually fought over. And that money had nothing to do with black bodies. Thanks for stopping by. We see comments like yours about the war not being about slavery all the time, yet we no proof using primary sources that prove it was primarily about something else. Where is your proof? We’ve got your opinion with no facts to back it up. We’ve got those worthless opinions in abundance. Where’s the proof to back up your claim? SHOW ME! The movie mischaracterized Col. Montgomery a bit. They portrayed him as a former slave owner who was a Union Officer, but closet racist. In reality he was a brutal abolitionist who hated secessionists and stated quite openly upon Col. Shaw’s objection, that he believed anything was fair game against slave owners. He would raid their plantations, take what he wanted, kill the masters and burn the rest down. Many things were “mischaracterized.” It’s a movie. Next post: Is the Real “Glory” Part of Our History of the Civil Rights Movement?